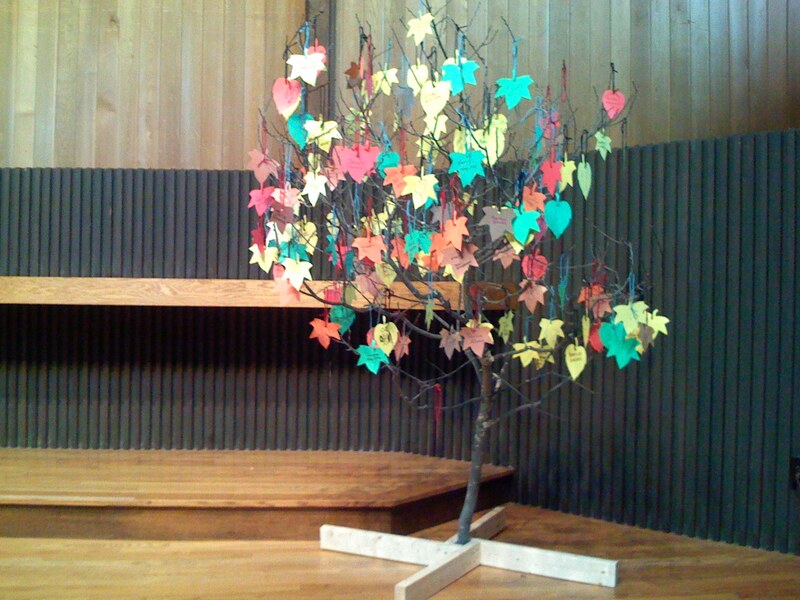 This Sunday is our Memory Tree Service. This is an all age service, an intergenerational service, where we as a community take a few moments to remember those whom we have known who have died. The picture here is of our tree with the leaves on it. But we start with a tree that has no leaves. It looks bare, lonely a bit cold. We each can take a leaf and write the name of someone, or if we cannot or do not want to write words we can draw a picture, on a leaf. And then we have a quiet time in the service where we come up and hang the leaves on the tree. People write the names of relatives, friends, famous folk who may not have been personal acquaintances, pets on leaves. It is up to each of to decide who or what each leaf represents. We leaf the tree as a community. Each of us brings our individual loss to the tree. The tree represents loss and grief, but it is also a thing of beauty. The Memory Tree ritual/service is one of my favorites. It has been going on for awhile. I have the leaf templates in my office. They were cut out of oak tagboard, long before there were computers and cutting machines. We take construction paper, yarn, and what is really a dead branch and we make something beautiful out of it. This leafing of the tree is a time to remember those who have died, those we have lost. It is a time to take a few moments to face the reality of death. But we do not do that alone. We do that in the midst of community. We do that within the loving arms of our friends and fellow spiritual travelers. And out of our act of remembering is created something of beauty, a tree full of the fall colors. This year my family has one more name to add to the tree. Elaine Navias’s name will hang from the tree this Sunday. I am sure that there will be a few tears shed by myself and my children. But I know that those tears will be shed amidst my beloved community where it is safe for me to share my grief, and where my grief will be honored and held in love. For it is the love of our community that makes our tree beautiful.